Our journey to Kerag ended successfully. On 20.02.09 Galya Chibitok, Slava Ivanov (Foma), Lesha Lonchinsky, Ivan Dojdev and Valery Shamalo left SPb, on 22.02 called at Oslo on their friends Marina and Fedya Ishakov on the way, on 23.02 arrived at a small town Lucibotn by ferry. We had to reach the mountain by kayak, which we took with us. We made 4 passages, because it was 2-seat, and we had a lot of gear with us. The distance was only 5 kilometers. 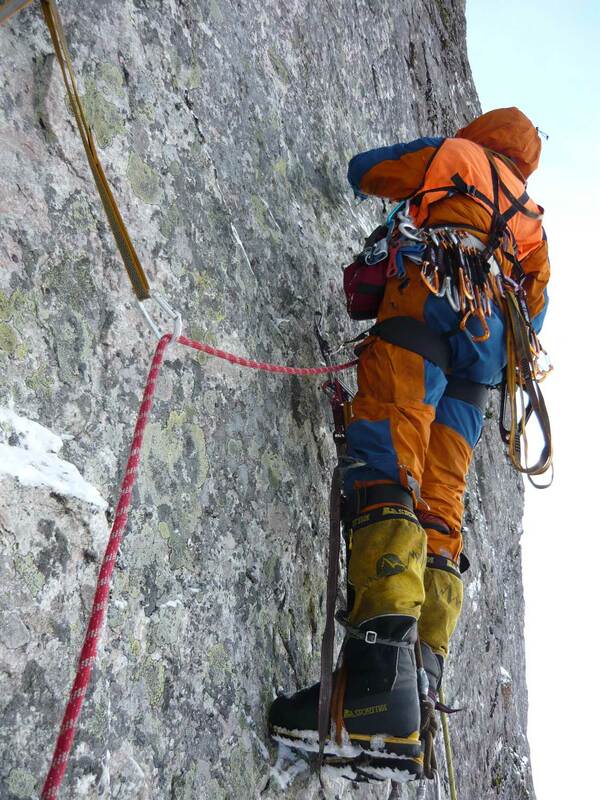 On 24.02 we brought our gear to the face, examined the route and started climbing immediately. We started climbing 20 m above the water. 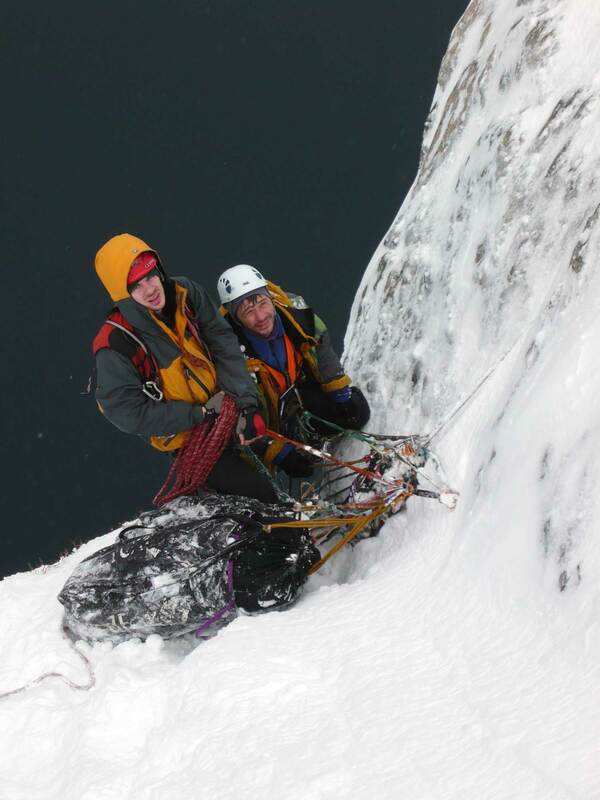 Starting from pitch six the serious climbing began, with overhanging and vertical sections. 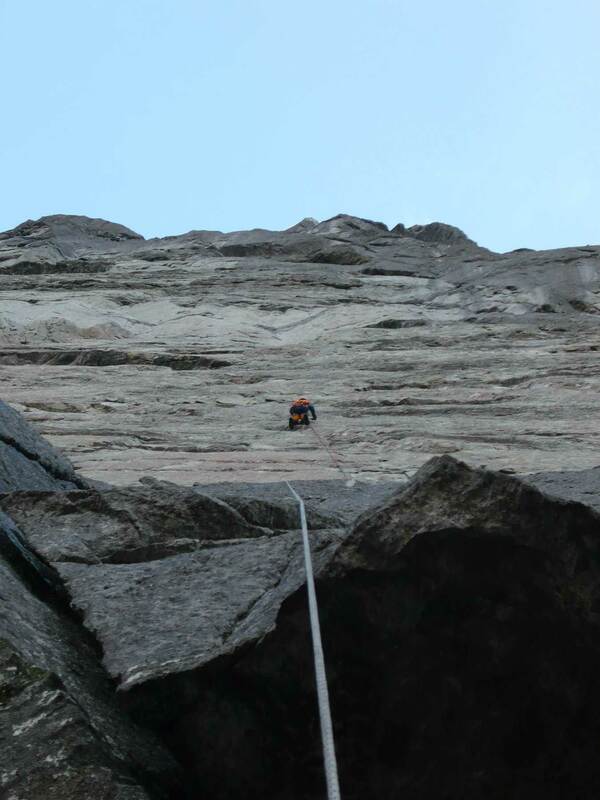 Before pitch 14 the route resembled a usual 6 А , people compared it with Dalar . But last 6 pitches, starting from pitch 15 was a huge overhang with minimum terrain, and the rock was very hard, it was difficult even to place bolts, especially on the most abrupt section - pitches 15, 16 and 17. The slope was 100 degrees steep, the rock was yellow because of large quartz content, which is strong, but can be easily split off. With Foma's heroic efforts the most difficult sections were bolted, but we passed 20- 30 meters a day. 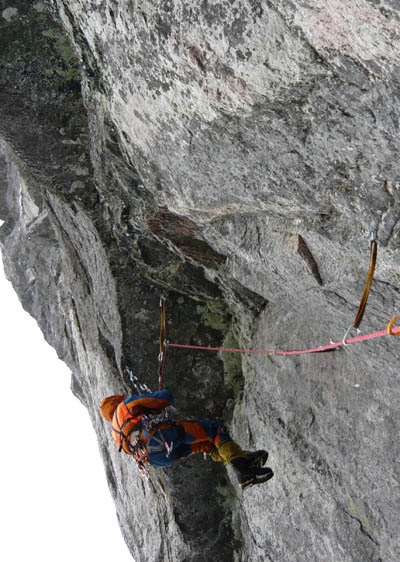 We had to spend night on a ledge in 3 ,5 pitches below the beginning of the overhang because there we had enough snow for cooking and drinking. 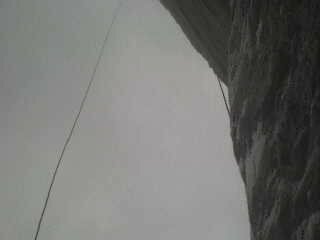 This route seemed to be set by someone we met descent loops and garbage on the ledges before the overhang. We discovered even cans, produced in 1999. We were frightened if we were ascending someone's route. 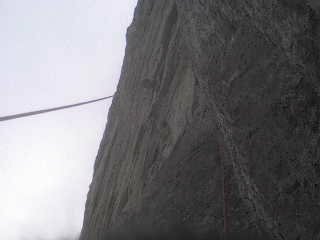 But in about 15 m after the beginning of the overhang it was the last loop, and there were no human traces later. 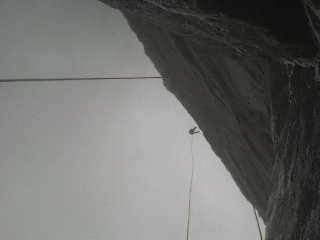 As a result towards evening of 09.03, after pitch 21, Foma climbed on a flat area, and on the following day rest of us ascended there with gear and a garbage pail, found in the middle of the wall!!! We took that garbage down, because we didn't want to leave such things on our route. 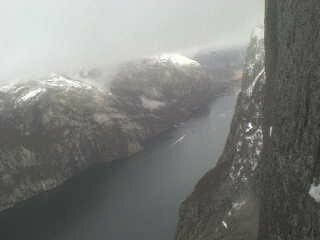 We descended to Lucibotn by 10-th night because of heavy haul bags, deep snow. 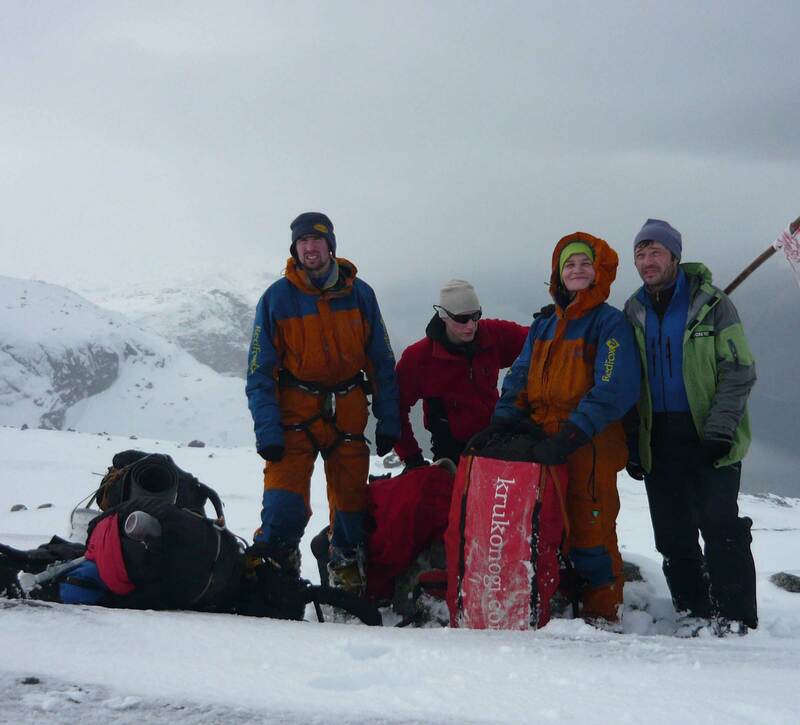 We took pictures on the summit (in several hundreds meters from the place where we ascended), all tired. We nearly got lost in fog. We wanted to leave as soon as possible, but we had to take the kayak and some things left under the face. Therefore I (Valery Sh.) took an inflatable rubber dinghy and pulled against the wind along the fjord. I did it, and we had time to sail away on a morning ferry. On our way we called on our friends in Oslo, Marina and Fedya gave us very warm welcome, and in the morning of 13 we were in SPb . People definitely estimate the route as a highest grade. Technically it is obviously more difficult than our last year's one on 4810, though it is shorter. Height of Kerag wall is about 1000 m, maybe between 950 and 1020. Route length is about 1100 meters, certainly not counting approach to the summit by tundra. 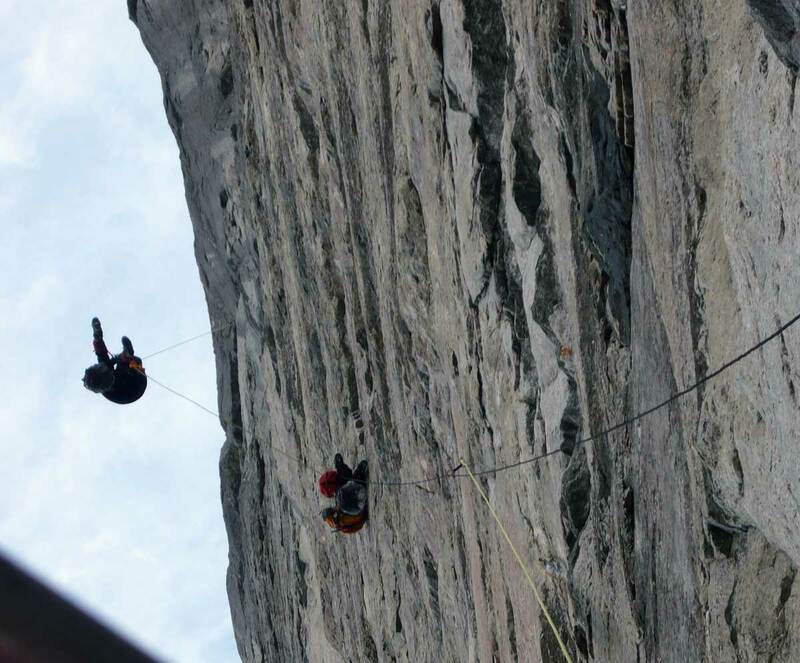 We fixed 21 ropes, and sometimes we left 60-meter dynamic ropes hanging. 2 ropes became beaten and frayed through (certainly, only their braid). The weather was very humid all the time, in the very beginning we were wet through with rain, all our puffs were wet with no chances to be dried out. We hadn't foreseen it, and all the time we suffered with cold. Though the frosts weren't strong, at least -10, but they were accompanied by wind and almost 10% humidity. As a result no one got nothing frostbitten, though arms and legs were constantly feeling cold. We had no traumas also, all the whippers were on the overhang. Everyone is extremely happy with everything, no one has ascended anything like this, very useful experience and a remarkable new Russian route in Norway mountains. Soon we'll try to make a photo report and a report for the Russian championship.